Downtown() A second year photography student at UAB has discovered a little known Birmingham landmark while researching in the archives department of the Birmingham Public Library. 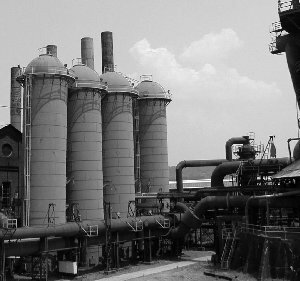 Josh Parker was trying to find some scenes of Birmingham life that he could use in a black and white photo essay on the city, when he stumbled on some photos of something called Sloss Furnaces. He made his discovery in a little known book entitled "The Valley and the Hills." This complete history of Birmingham devotes considerable space to Sloss Furnaces and its impact on the entire Jones Valley area. Parker immediately realized the furnaces' importance and thought that a few choice photos of the place (if it still existed) would round out an already strong collection that includes Arlington Antebellum Plantation, Donnelly House, and Ramsay High School. Little did he realize the industrial splendor that awaited him at the forgotten site. Upon arrival, with Bronica in hand, Parker's eye was immediately drawn to the symmetry of the furnaces rising like grain silos from the desolate landscape. "I can't believe this place is here, just a few blocks from downtown," said Parker. "Who would have thought this place was here? It is so deserted looking." It is the same look that Parker was able to capture in his essay. The juxtaposition of the old industrial Birmingham, against the gleaming white of the new medical and financial economy. Most local residents had forgotten that past, and Parker's discovery has prodded some memories into action to try and save the old place. "We should make it into a museum or something," came one suggestion from long time Woodlawn resident Vince Ogletree. "People should know what it was like in the old days. I can remember when the entire Jones Valley was covered in the soot that belched forth from those furnaces." Others disagree with the importance of old things. When examining Parker's photos at the UAB library, Gene Hallman was heard muttering under his breath. "Why not tear it down and build something useful like a half-dome? What is the purpose of reveling in the past when we don't have that much of a past to revel in?" The final fate of Paker's new discovery is as yet unknown. What is certain is that Sloss Furnaces is a cool place to take pictures. Crestwood() Tired of all the crass commercialism which has come to define the Christmas season, local man Thomas Cramer discovered the true meaning of Christ's life at, of all places, a garage sale. The garage sale of the Bishop family on 56th Street South in Crestwood is where Cramer stumbled across the Jesus video which was sent to most Alabama residents for free. When the CCC mailing took place, Cramer was living in Pennsylvania and did not know of the free video about the life and teachings of Jesus Christ. It just so happens that the Bishops decided to part with the video as part of their annual after Christmas garage sale. This is the sale that allows them to clean house and get rid of the year's accumulation of junk. The Bishops had been holding onto the Jesus video for a few years, but finally made the decision to sell it this time, figuring they had gotten everything out of it they were going to get. And lo and behold along comes Cramer in his newfound after Christmas 'less commercial' mode and spies the video priced at one dollar. "I thought that was a great deal," said Cramer. "You can't even get a blank tape for a buck, much less a highly produced and effective look at the life of Christ. This is just what I've been trying to tell the wife, you don't have to spend a lot of money to have Christ in your life." When told that the video was a free gift from CCC, Cramer was undismayed. "Paying a buck for something that I can no longer get is not such a big deal. Especially when you remember that Jesus is the reason for the season." Cramer is hoping to save the video until next Christmas when he can show it to his family instead of going out to the movies. Southside() Food, beer, and most importantly a cherry spot in Five Points comprise the magic formula which is the key to The Birmingham Mill's success. Add to that the fact that The Mill is open late, and you have the winning combination that has kept them the dominant gathering place for non-Studio patrons for almost ten years. While other area eateries eschew the lucrative if somewhat bohemian late night crowd, The Mill embraces them with open arms and taps. Impromptu research among several Southside regulars seems to indicate that if The Original Pancake House were open more than three hours a day, The Mill might have less food business. According to one interviewee, "they [Pancake House] have a great location and good food, but no beer. I think being open late would compensate for the no beer thing." 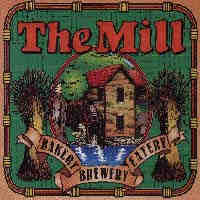 Another had a different take, "I mean the only reason to eat at The Mill is that you get hungry after all that beer. If I had the choice I would rather walk across the street for pancakes around midnight." Southside super regular Tyrone Pool was more enthusiastic about The Mill's offerings. "We usually meet up at The Mill for a beer and just kinda hang out. Sometimes we go to the Break to play pool. There is so much happening at The Mill, what with Tuesday night bingo and lots of live music, it is hard to stay away." Other places have tried to emulate The Mill's model, but have always been missing something. Breckinridge Brew Pub offered beer and food, but not being on one of the five points made them difficult to find. The Magic City Brewery's location was even worse, though they managed to hang on for several years by enticing cigar smokers with an upstairs lounge. "Perhaps if there was some kind of Southside Shuttle that would take people to all of these out of the way places," says urban planner Jeremy Bentham. "As it is people just kinda like to stay by the fountain and go to The Mill. It certainly isn't for the food and service. They have crap in spades on those counts." Whatever the reason, The Mill continues to thrive in the hostile Birmingham landscape.